Once the capital of the mighty Khmer Empire, Angkor meaning 'city' in Khmer, features an array of fantastic landmarks and relics. The Angkor temple complex has long been considered one of the Wonders of the World and today is a UNESCO World Heritage Site. It comprises of 72 historic monuments and structures, which date from the capital's founding in the 9th century through to its completion in the 14th century. Be sure to check out the spectacular remaining structure of Angkor Wat. The massive stone faces of the Bayon and elaborate carvings display the most exquisite artistry of the ancient Khmer civilisation. 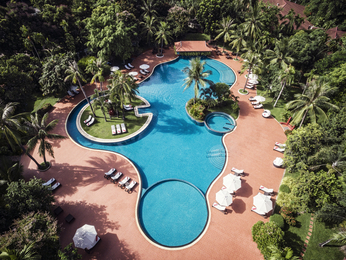 Accor Hotels in Angkor specialise in modern facilities and world-class service for tourists in Angkor. Our 5-star accommodation is located amidst fantastic natural scenery with golf and spa resorts. Guests can rest in comfort and luxury while soaking up the unique ambience of this beautiful city.